A recent Sunday afternoon found us in Winter Park, and we had lunch at Eola Wine Company. It was a good choice, and there are many choices in Winter Park. We both agreed, based on our experience here, we'd come back! 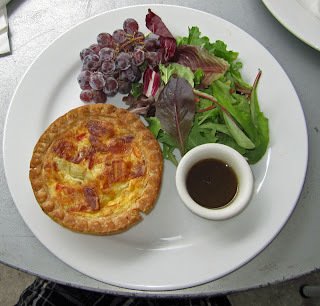 We both were in the mood for something rather light, and their brunch menu seemed just perfect. We started out with the Mimosa Flight, samples of four of their signature Mimosas. The price included one more of the favorite. The flavors included Raspberry, Peach, traditional (orange), and Banana. Our least favorite was the banana, as there was no discernable banana taste. Our most favorite was the Raspberry--great flavor. We split on the other two. For my brunch I had the Tomato, Artichoke and Bacon Quicche. It was fantastic. It was a personal size quicche with a very nice an buttery crust. The flavors were very good and quite distinct, though i had a harder time tasting the artichoke. Still, it was very good. The mixed green salad that accompanied it was very good, and i had a house balsamic viniagrette with it--yumm! It was accompanied with a bunch of small red grapes--small in size, but huge in flavor. This was a very good dish. 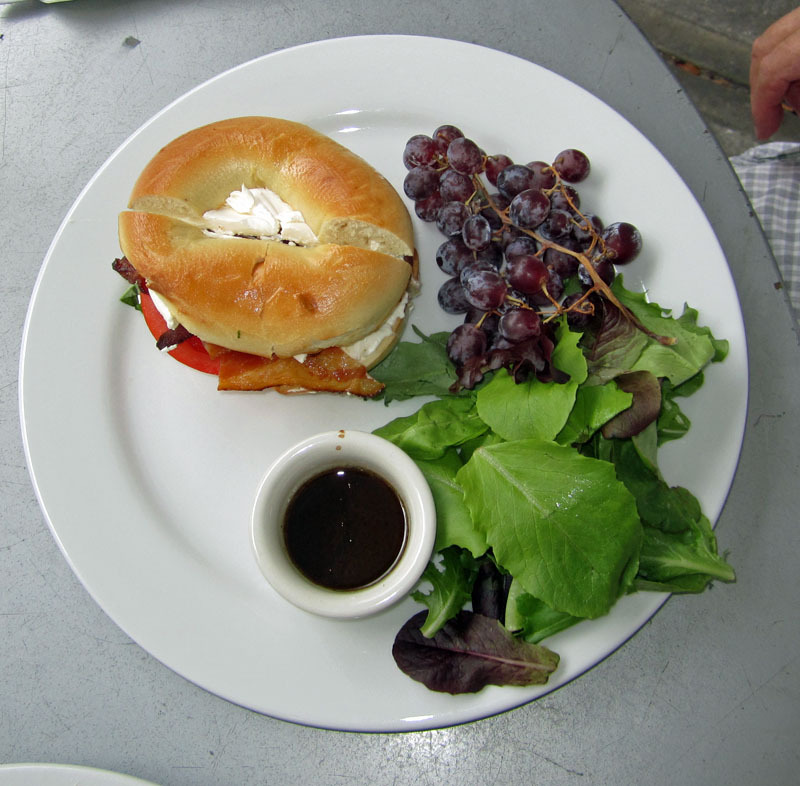 My friend Tommy had the BBT, a bacon, basil, tomato and cream cheese sandwich served on a bagel. It was fantastic! It was very good. the creaminess of the cream cheese was a nice contrast to the bacon and tomato. It, too, was served with a salad of mixed greens and red grapes. We really enjoyed our meal here. Our service was attentive, even though we sat outside. We had a chance to do some people-watching on a nice summer afternoon. Lucky for us it had rained a bit early and so the heat was not so bothersome. This was a very nice place and I'd come back here again. Nice job! I found Romansa Restaurant, Wine Bar & Lounge while searching urbanspoon.com for Eastern European restaurants. So we went there for dinner. It was OK, some hits, some misses. Definitely interesting. Romansa has a few Serbian items on their menu, but in general it's a pretty general menu and would please all manner of diners, from steaks and fish to burgers and fries. 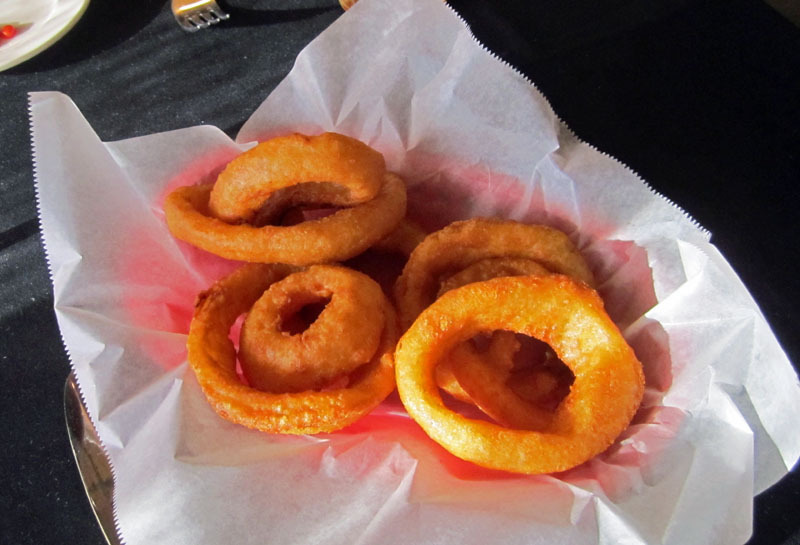 We started out with an appetizer, the Beer-Battered Onion Rings. The onion rings were perfect! I nice beer batter was fried to absolute perfection, They were tasty and served piping hot. I would not change a thing abou them. Certainly an American food item through and through, but also done right. There are many chances for error with somethign as simple as onion rings (old oil, under/overcooking, too much/little salt, etc. ), but these were done right. We started of with salads. The salads themselves wer ordinary, iceberg lettuce cut into small squares. I bit of mixed greens would have made the salads a bit exotic. Simple iceberg screams "diner" to me. The were garnished with a bit of carrot and red cabbage, and a slice of tomato. 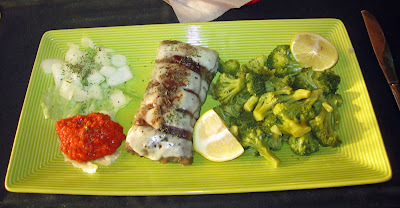 I had the house dressing and it was very good, an oil and vinegar with a somewhat Italian-like combination of herbs and spices, yet some flavors that were not run-of-the-mill and said "exotic" to me. I liked it, outside of the plain iceberg lettuce. My friend Tommy had the Blue Cheese dressing--it was common and ordinary, most likely out of a bottle. We also had some bread with our meal. 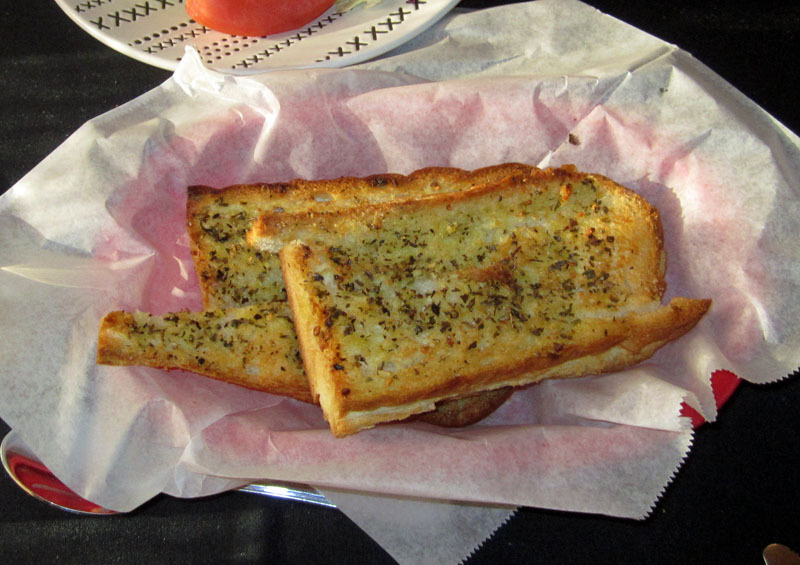 It was very good, nice and crusty, and the seasoning on the bread, a flavor theme that ran thoroughout our meal, was also very good. I ordered two entrees, only because one was available in a small size, and because both were Serbian, a type of food I've never had before, that I recall. 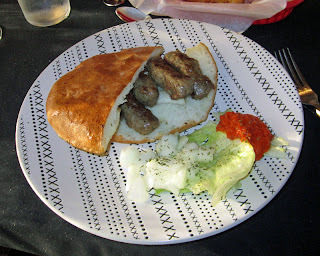 The first was called Cevapi, small, grilled, rolls of minced meat that were spiced with "secret spices. They were served on a very delicious bun of sorts and accompanied by a bit of iceberg lettuce, some chopped onions, and a delicious red pepper and eggplant puree. The meat was very good and also quite spicy, though not in a "hot" sense. It was good with a lot of flavor though perhaps just a bit dry. I'm not sure how you'd keep meat in this condition more moist. But this was quite good actually. My second (and main) entree was called Pljeskavica, a ground beef patty that was mixed with "secret spices" and stuffed with bacon and cheese. It was tastly and flavorful. It was also just a bit "tough." A steak knife would have helped. I would guess that if you're going to finely grind meat and add spices, then it would be a bit tough. It was tasty and flavorful, however. It was also accompanied by the lettuce, onion, and red pepper/eggplant puree. For a side I ordered the steamed broccoli. Unfortunately what I got was well overcooked broccoli that was a drab green color, cooked well beyond the few minutes of steaming it should have gotten. I think it was over-sauteed. It was edible, but certainly not the great side it could have been. 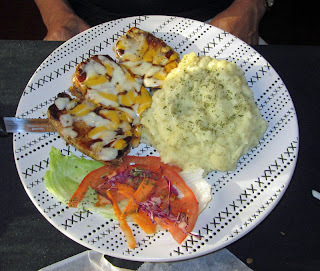 My friend Tommy ordered the Roasted Pork Medallions, accompanied by Mashed Potatoes. 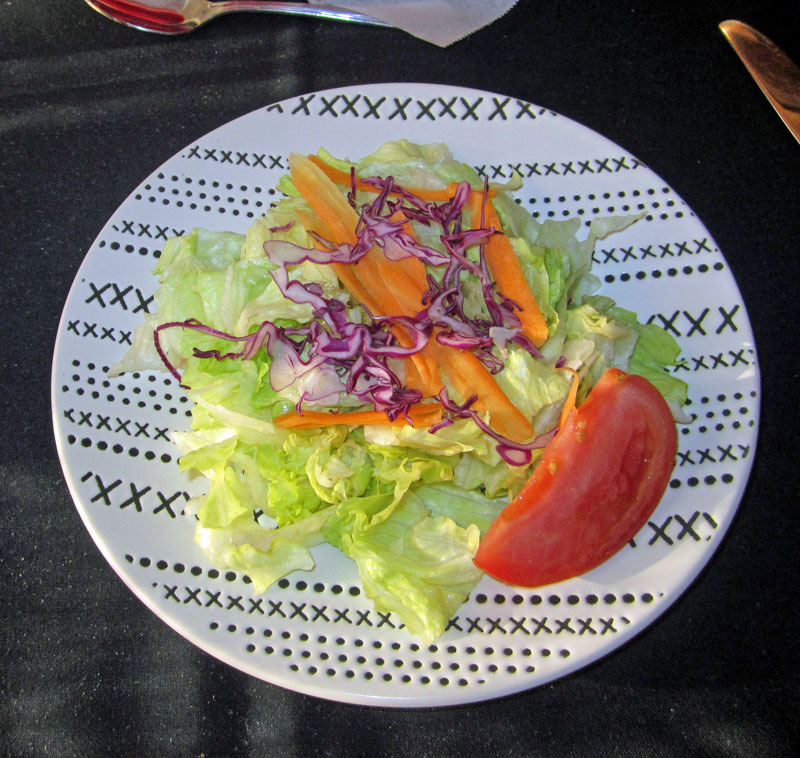 It was served with a garnish of a leaf of the aforementioned (and overused) iceberg lettuce with a slice of tomato and a few shavings of carrot and red cabbage. The mashed potatoes were pretty ordinary, though appeared "real" and not from a box. The disappointment here was the meat--it was very dry. Like way dry. The BBQ sauce and cheese that topped the medallions added some nice flavors, but the meat itself was dry, very dry, and thus a bit chewy. I would say this dish was a miss in that sense. Pork is hard to cook properly because of its low fat content, and this was a miss. Our service during our meal was excellent. We were one of only two tables during our meal, but were well taken care of. Our waitress--the ticket says her name was Dragana--certainly knew the food and the menu and took very good care of us, along with another young lady who was "in training." I'd guess that perhaps Dragana is Serbian, she certainly knew the food and the names of the dishes rolled off her tongue quite easily. The prices were decent and the $5 house Merlot was good and an adequate pour. I'm not sure that I'd go back for the Serbian food for dinner, but I'd certainly like to try them for lunch, they have a nice selection of burgers and other lunch food. 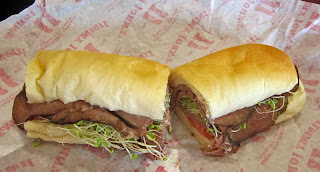 I had a quick lunch recently at Jimmy John's Gourmet Sandwiches in Lake Mary. I left with mixed feelings. Not bad. Not great. Kind of middle of the road with more minuses than pluses, I think. But I'll give them the benefit of the doubt at this time and vote "like." I reserve the right to change that at a later date. 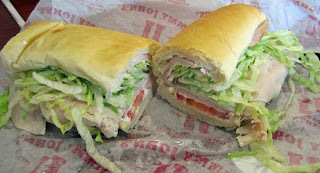 Jimmy John's Gourmet Sandwiches is a chain and they have sub sandwiches. We were greeted by a seeminly bored and somewhat disinterested young lady at the counter who talked in a quiet voice and quite fast. It was our first time but she sure did not take any pains to make us feel welcome or to help us out. But, after a few moments, we were able to order. We placed our order, accepted the suggested "make it a combo" question. and were handed our receipt. If she thanked us, I did not hear it. We had to ask where we pick up our sandwiches, to which she replied and motioned to the nearby counter. We found the drink machines, then went back to claim our chips, and by now the sandwiches were ready--we heard someone mention "ten and eleven," the numbers of our subs. Upon sitting down, I looked around for napkins. I could not see any. I went back to the counter and asked the aforementioned young lady and she sort of gestured to the other end of the counter where there were a few (and only a few) scattered behind the counter. I guess I had to help myself, so I did. 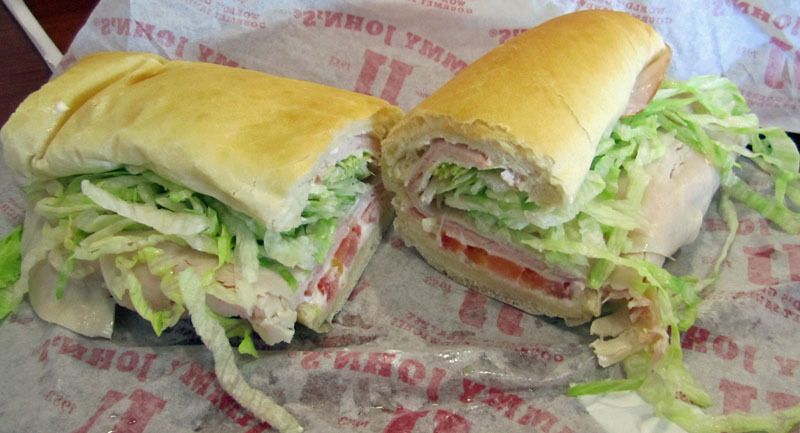 The sandwich was OK, but only OK. The lettuce and tomatoes and meat all were good and fresh. And the bun (called french bread) was fresh. Maybe just a bit too fresh. It was just a bit doughy and a bit light in color--it should have been cooked another minute or two, it would have been much better. It was not bad, just not perfect. 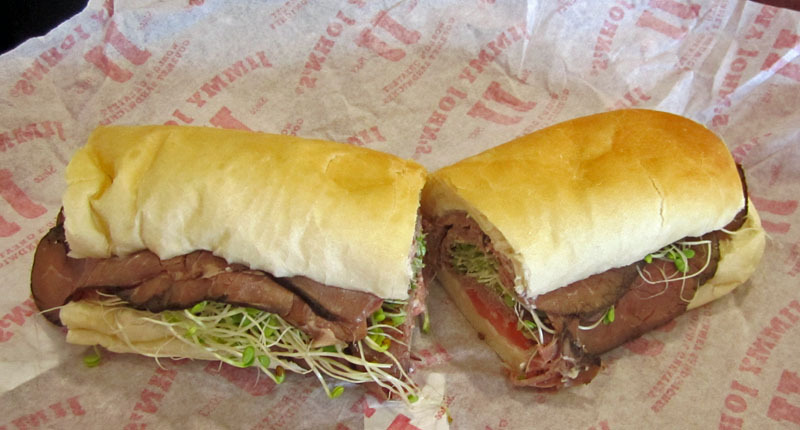 When there are so many choices for lunch, and so many sub shops, you really have to be perfect--this was not. One of their claims to fame is speed. Indeed, we'd barely ordered our sandwiches when they were ready, so they really were speedy. And the prices are rather decent for the amount of food. It was good, just not great. 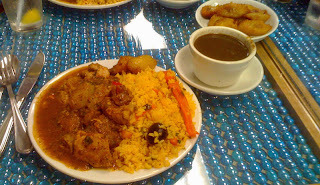 I had a most delicious lunch here at Vida Latin Restaurant the other day and will certainly be back for more, and soon. I went with friends from work who had raved about the food, service, and value and found they were right. I ordered one of their specials--it was only $8.88 and was more than I could eat. 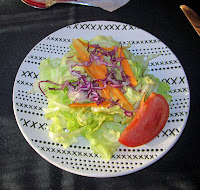 The meal started with a small delicious salad of chopped greens, carrot, and a few other normal salad fixin's. It was good. But the main star was the plateful of food that soon arrived, and the accompanying black beans. There was a good-sized mound of pork that was tender and delicious, and accompanied by a wonderful "gravy." The vegetable rice was also very good, nice and tasty, and fresh. And the cup of black beans? Well, I'd say they were about the best black beans I've ever had, simply outstanding. Oh, and don't let me forget the tender, sweet plantains. All in all it was a wonderful meal with wonderful service. I will certainly go back again, and soon!